Location: Near Nordkjosbotn in Troms, Norway. How to get there: A good starting point is the village of Nordkjosbotn. 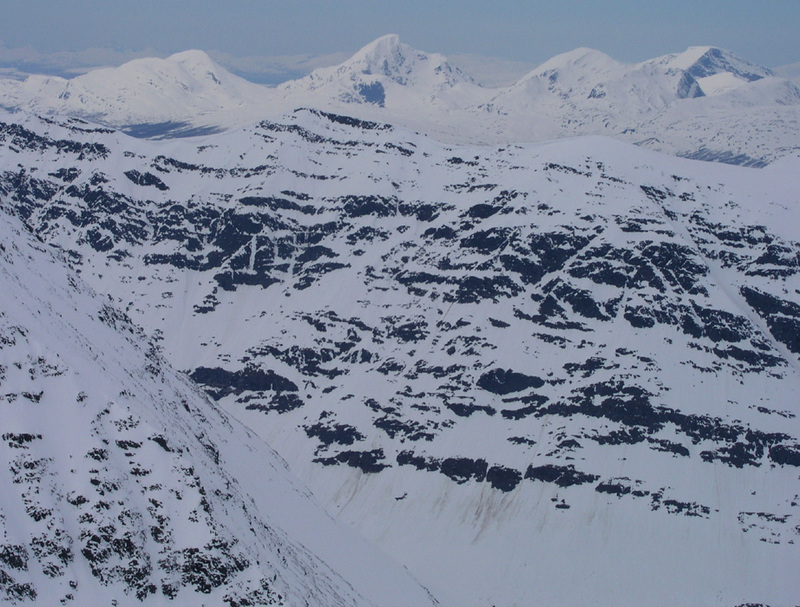 This is 73 km south of Tromsø. Locate the local road that runs east from Nordkjosbotn south of Hwy. E-6 and the river, there are signs for the school and the church. 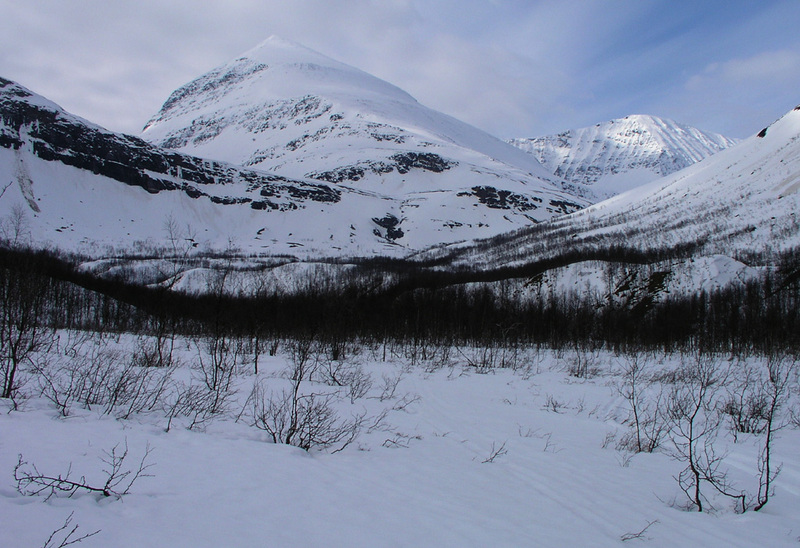 Drive about 5 km, look for the creeks that crosses the road coming down from Kjusakdalen. Three trails are marked on the map, the best one to use is number three. This trail goes right from the road just after you cross the second bridge. This is the trailhead, elevation 40 meter, north 69:11.535, east 019:39.037. The best parking is on your left about 200 meter before you arrive at the trailhead. 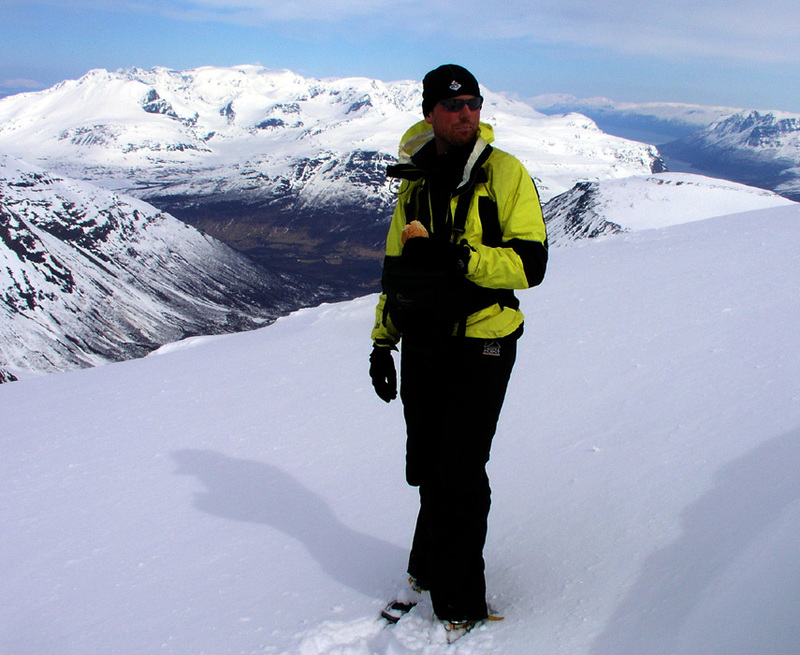 One can stay at Vollan Gjestestue, phone (+47)77722300 in Nordkjosbotn. This is quite a nice place with reasonable rates. 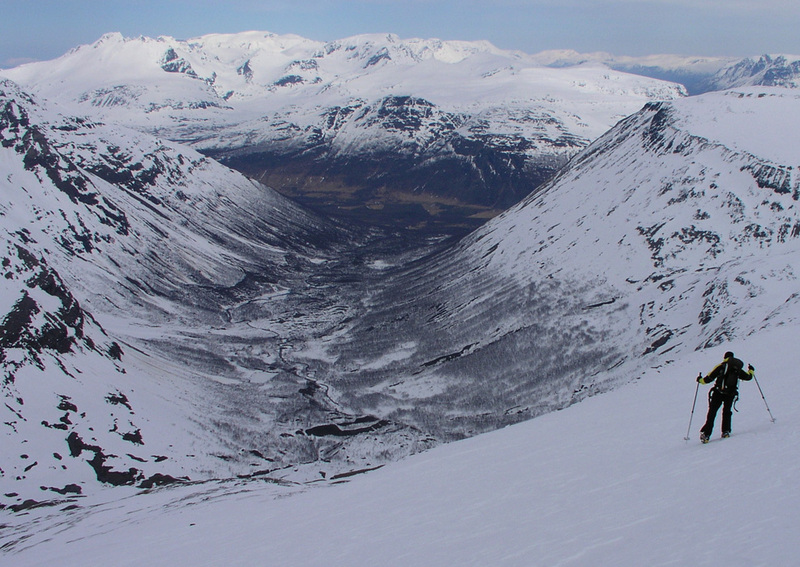 Route description: Follow the trail as it heads up and into the Kjusakdalen valley. Higher up, the valley turns right and becomes more narrow. After 5.8 km you are at the bottom of the impressive, broad ridge that heads upwards. Your location is now north 69:09.255, east 019:33.258 at elevation 471 meter. Continue up the ridge, the slope is pretty easy, but you will observe the crux area above, a somewhat steeper band that runs across the broad ridge. The steeper part is on your left above 1240 meter of elevation. An ascending traverse that gains more gentle slopes immediately to the right (west) of the steeper rocks will get you up and above this obstacle. From here, continue uphill towards the horizon ridge, then follow this (well away from the edge!) to the summit. Comments: I did this climb with my friend Ståle Grimen. This was his 6th. (and last) peak in a week of our T5 expedition. I drove him to the Tromsø airport well ahead of the departure time. We started at 0715, hit the summit at 1215, stayed for 30 minutes and returned down in 2:15, arriving at the car at 1500. 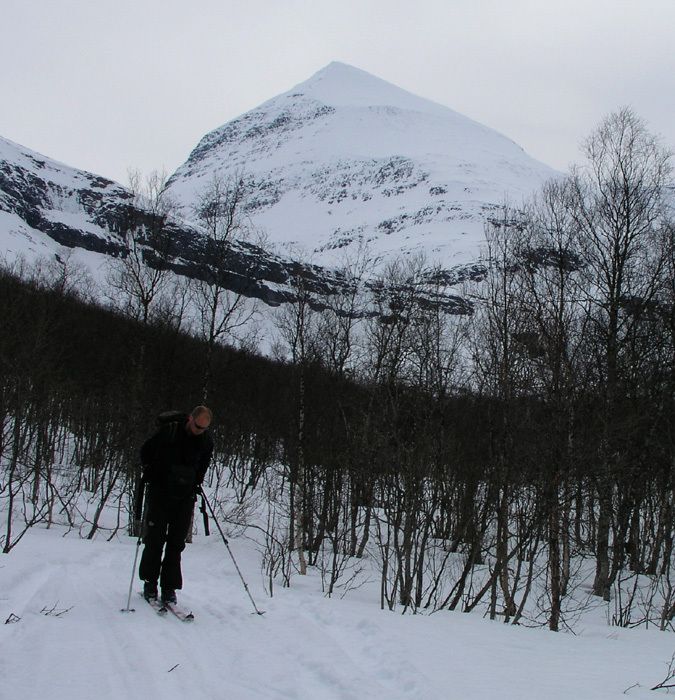 I received a nice email from Aadne Olsrud confirming that the name of this peak really is "Lille Russetind", which means "the small Russetind", this is a bit funny as there is also a "Store Russetind" (Big Russetind), nearby, but Lille Russetind is the highest peak in this area. This was peak number 8 in my T5 trip. Next peak Vanntinden. Previous peak Snøhetta. 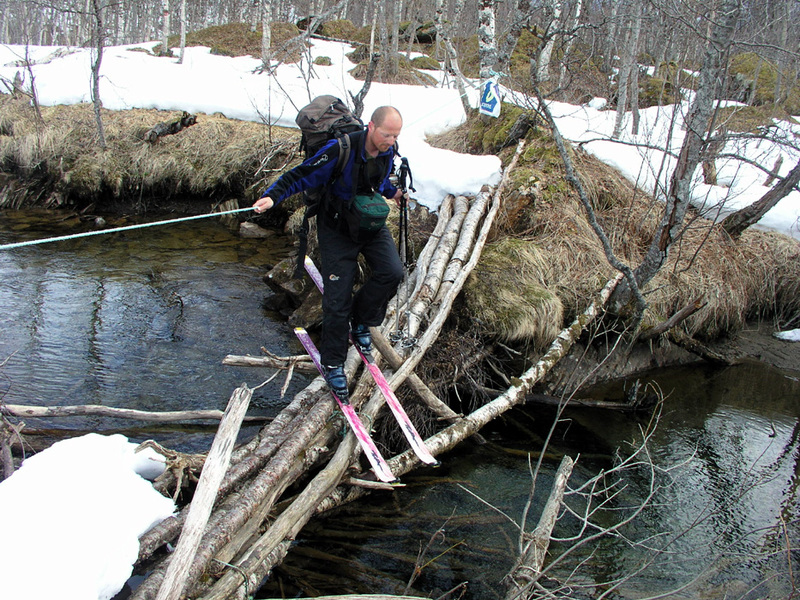 Ståle skiing across the river. Lille Russetind comes into view. 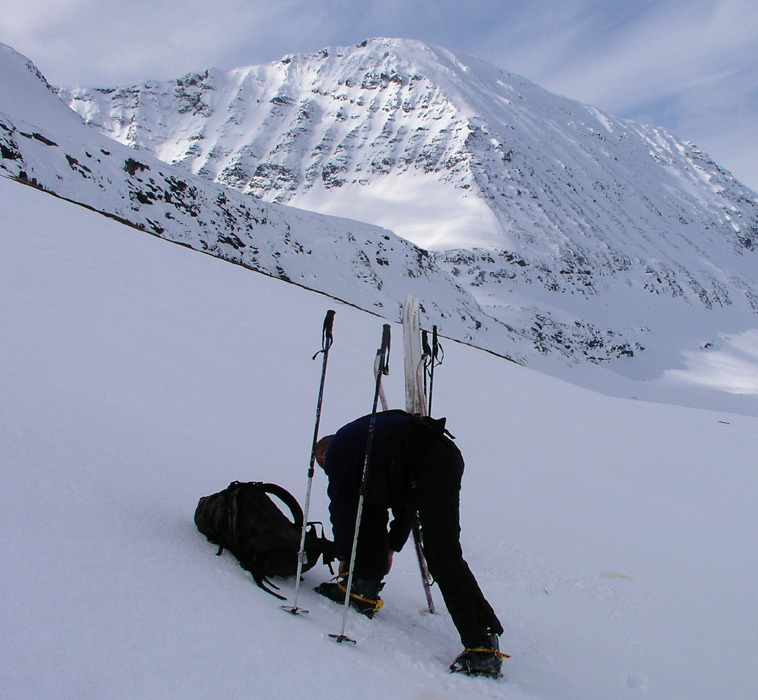 Ståle leaving the skis and putting on crampons due to hard snow. 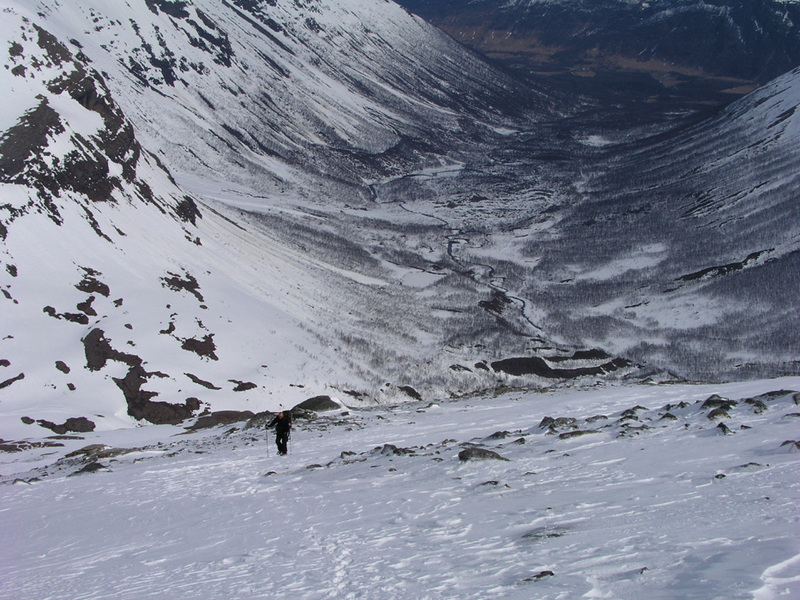 Ståle ascending on Lille Russetind. Looking uphill, the hardest part is yet to come. 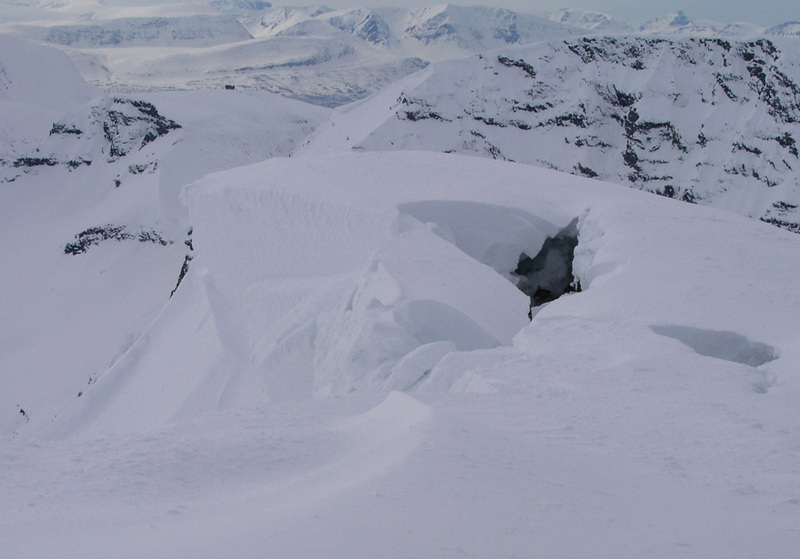 Summit cornice about to break away. 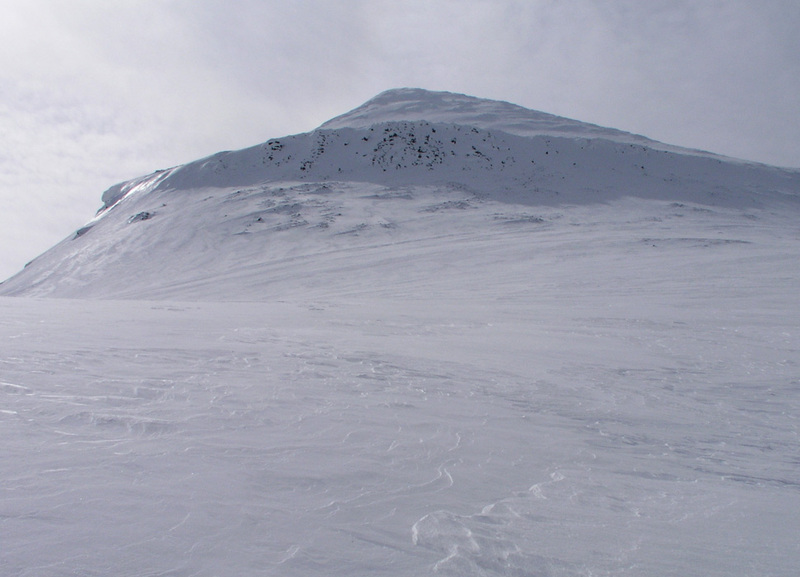 Blåtindan (middle peak) as seen from Lille Russetind. Valley view, we hiked in this way. Ståle back down in the valley. A week full of summits is near its end.